Convert OGG video to MP4, WMV, MOV, MKV and 1000+ video/audio formats. Nowadays, more and more media file types are available in the market, and all kinds of devices are compatible with the media files. However, these devices don't have full compatibility for all the multimedia files. For example, older Android smartphones may play MP4 videos correctly, but when it comes to other video file types, the devices won't recognize them. 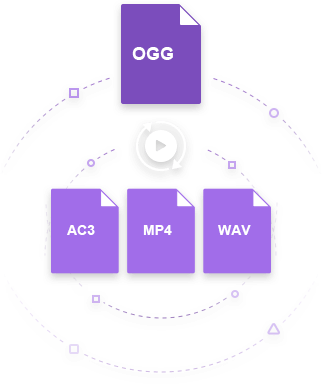 Therefore, you probably need a way to convert OGG to MP4, preferably with zero quality loss. This article will introduce how to get the work done. Wondershare UniConverter (originally Wondershare Video Converter Ultimate) is such a program that can help you to convert video without compromising the video quality. Wondershare UniConverter (originally Wondershare Video Converter Ultimate) is rich with features, and has a slick interface that can be handled even by the novice users. Wondershare UniConverter (originally Wondershare Video Converter Ultimate) is mainly used for converting videos and burning videos to DVDs. This program is fully compatible with more than 1000 video and audio formats, and it will convert or burn the videos with no quality loss. Convert OGG to 1000+ formats, like MP4, AVI, MKV, MOV, etc. Therefore, no matter where you get the OGG file, you are able to convert OGG to MP4 video file with simple clicks. The following guide will show you how to get the work done easily. Check it out. Start UniConverter (originally Wondershare Video Converter Ultimate) after the installation. Now you can either drag and drop the OGG file into the program window, or click the Add Files button to add the media files from your computer. Now click the drop-down icon beside Convert all files to at the upper right corner of the software window, go to Video > MP4 and select your desired resolution in the right to confirm MP4 as the output format in the pop-up dialog. Click the Convert All button at the lower-right corner of the primary window, then Wondershare OGG to MP4 converter will start converting OGG to MP4. When the conversion finishes, you can switch to the Converted tab to locate the converted MP4 video. There are lots of free file converters available on the Internet, and both the online and offline converters are helpful for you to get the work done. But many people are looking for an easy way to convert OGG to MP4 free. In fact, one of such free converters that can provide help is Wondershare Video Converter Free. 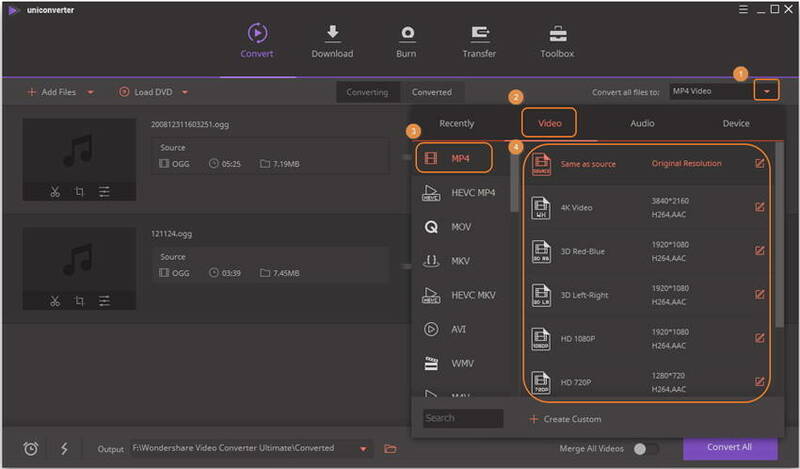 Wondershare Video Converter Free is a fast, compact and efficient video converter that can help you to convert videos to the most popular video and audio file types without any quality loss. 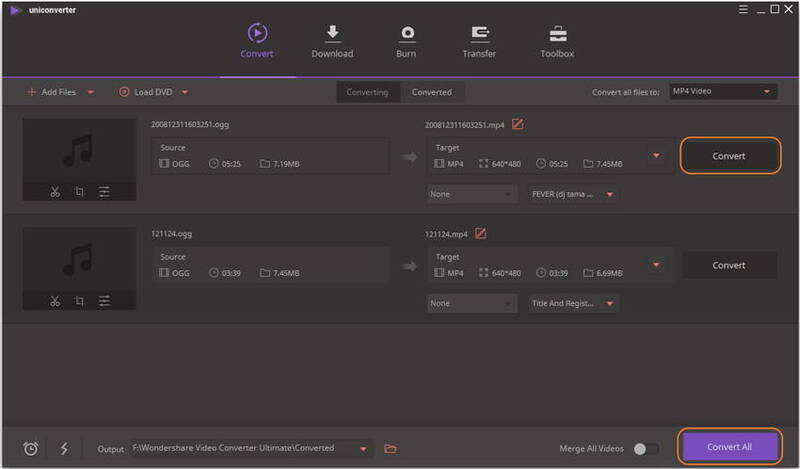 The Free OGG to MP4 converter has a built-in Smart Fit option that don't even need you to make up the settings, as the converter will automatically fit the settings for the conversion. 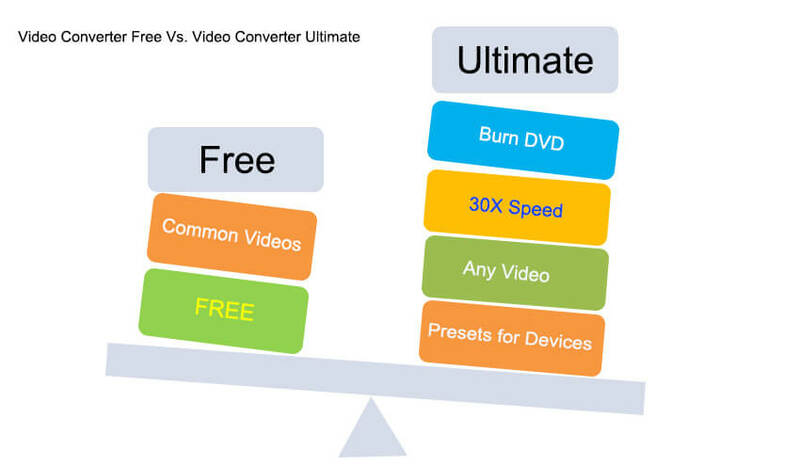 With Wondershare Video Converter Free, you are also able to convert OGG to MP4 with ease, but when comparing the free converter to UniConverter (originally Wondershare Video Converter Ultimate), you can easily figure out that UniConverter (originally Wondershare Video Converter Ultimate) empowers more helpful features that the free converter. All files can be merged into a single file, which is quite a nice feature that streamlines video editing. 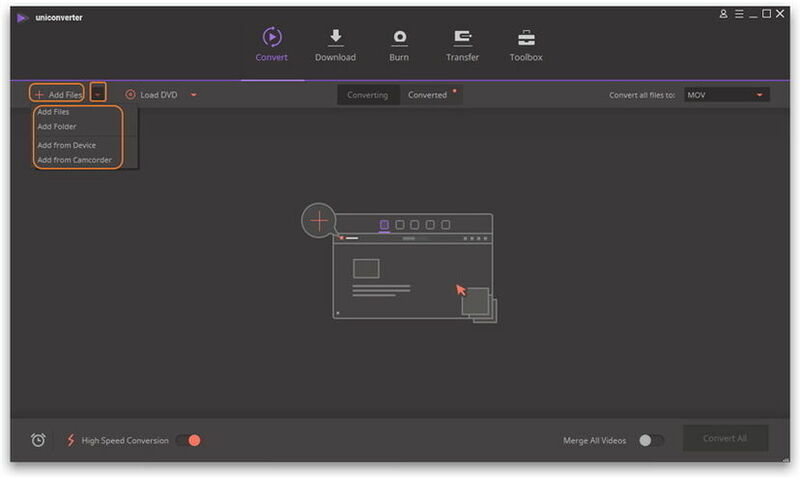 Wondershare Video Converter Free also comes with a built-in video player called the Wondershare Player, accessed by clicking the Play tab in the converter. Step 1. Drag&drop the OGG file into the main interface of Wondershare Video Converter Free. Step 2. MP4 format should be selected by default, but if not, please click the format icon at the right side and choose MP4 as output in the pop-up dialog. Step 3. Now click the Convert button at the lower-right corner of the program to start converting OGG to MP4 file. When the conversion finishes, you can click the Open Folder button at the middle bottom to locate the converted video. In the market of media files, there is an outstanding wealth of different file formats. In fact, every major technological company has tried, at one point or another, to push its very own media file format in the hopes of both avoiding potential copyright infringement and creating a proprietary “walled garden” where it will herd and milk the users. Over time, this caused utter chaos as each company intentionally made life difficult for the end user, who just wanted to watch a cute fluffy kitten yawn. To resolve this stalemate, the .OGG file format was created in 1993, with the intention being to have it eventually become the ultimate media file format, compatible across all devices and operating systems without the need for additional software or hardware. However, Apple did not want to lose its foothold by giving up the iOS “walled garden” it had created so far, Google didn’t want to use .OGG either, as it estimated converting the entire YouTube library into it would be almost impossible, while Microsoft simply refused to engage in the conversation about .OGG altogether. Hence, the dreams of .OGG one day becoming the ultimate media file format were dead, although every media player and browser support it. Still, Linux users use .OGG files extensively, as it is an entirely open-source file format and as such is in line with the Linux philosophy. How to play OGG on Windows and Mac? All media players and browsers can, by default, support and play .OGG files without any problems. For Windows users, Windows Media Player can be used, provided that the appropriate codec is installed, while Mac users can use iTunes or iMovie with the installed XiphQT 0.1.9 codec pack, available for free from the Xiph.org website.